The success of the traditional food movement boosted the popularity of fermented foods, and we finally realized the wisdom of our ancestors. People have consumed fermented foods for centuries, due to the numerous health benefits they offer. “Sauerkraut, a form of fermented cabbage, has been popular throughout Central Europe for hundreds of years. Sauerkraut combines one of the healthiest foods there is (cabbage) with one of the most beneficial and time-honored food preparation methods ever used (fermentation). According to the Institute for Integrative Medicine at the University of Witten in Germany, sauerkraut is one of the most common and oldest forms of preserving cabbage and can be traced back as an important food source to the fourth century B.C. 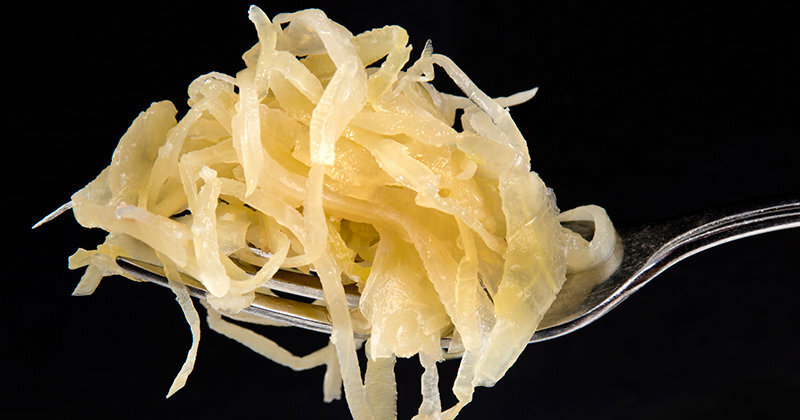 Sauerkraut is made by pickling cabbage in a process called lacto-fermentation. It is a rich source of enzymes that support digestion and help the absorption of nutrients in the body. However, the store-bought sauerkraut is pasteurized and treated with numerous chemicals, so it no longer offers the same benefits. Remove the large outer leaves of the cabbage, and shred the rest of it. In a bowl, mix it with the salt, and in order to stimulate the release of its juices, massage it with your hands for about 15 minutes. Then, transfer the mixture to a larger fermentation container, pound it down for the juice to come up to the surface, and cover it with a plate. You should leave about 2 inches of space at the top. Place a heavy glass jar with water over the plate to press it down and force the water out of it. Keep the container at room temperature, in a cool, dark place, covered with a towel. The fermentation process will take about a month. Afterward, store the sauerkraut in the fridge, and enjoy its benefits on a daily basis!